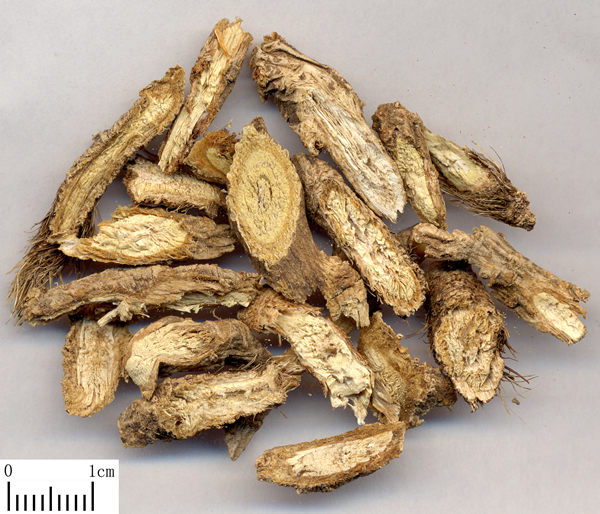 The root of perennial herbaceous plant Saposhnikovia divaricata (Turcz.) Schischk. of family Umbelliferae. Mainly in the northeast of China and the east of Inner Mongolia Autonomous Region in China. Slightly fragrant smell and sweet taste. Big strip with dark brown skin, slightly brown on the cross section of bark and greyish yellow of woody part. Sliced, unprocessed or stir-baked to charcoal. Pungent, sweet, slightly warm; lung, liver and spleen meridians entered. Dispel wind and release exterior, expel wind-damp, alleviate pain. This herb primarily dispels wind and releases the exterior pathogens. Its property is mild, sweet and slightly warm. For this reason it can be used for exterior wind-cold, wind-damp and exterior wind-heat syndromes. It is indicated for exterior wind-cold syndrome, marked by headache and body pain, aversion to wind-cold. It is usually combined with herbs that disperse wind-cold. For instance, it is combined with Jing Jie and Qiang Huo in Jing Fang Bai Du San from She Sheng Zhong Miao Fang (Excellent Prescriptions for Health Prescription). It is indicated for exterior wind-damp, marked by binding headache, heavy body and limb pain, and is usually combined with herbs that dispel wind-cold and expel dampness. For instance, it is combined with Qiang Huo and Chuan Xiong in Qiang Huo Sheng Shi Tang from Nei Wai Shang Bian Huo Lun. It is indicated for wind-heat exterior syndrome, marked by fever and aversion to wind, throat pain and thirst. 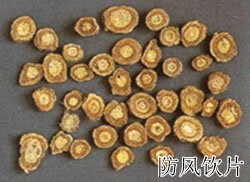 It is usually combined with Bo He, Lian Qiao and other herbs to dispel wind-heat. Because its dispersing action is mild, it is indicated for situations where the defensive qi and the exterior is deficient and for those with wind-cold pathogen. This herb is usually combined with herbs that benefit the defensive qi and consolidate the exterior, and they have the effect of supporting the healthy qi and expelling the pathogens. For instance it is combined with Huang Qi and Bai Zhu in Yu Ping Feng San from Dan Xi Xin Fa (Danxi's Experiential Therapy). This herb dispels wind and stops itching, and can be used for all types of skin diseases. It is usually used for urticaria and itching caused by wind pathogen. It is usually combined with herbs that are good at dispelling wind and alleviating itching like Bo He, Chan Tui and Bai Xian Pi. Itching usually belongs to blood deficiency and wind dryness, and for this reason it is usually combined with herbs that nourish blood and moisten dryness like Dang Gui, Sheng Di Huang and Mu Dan Pi. 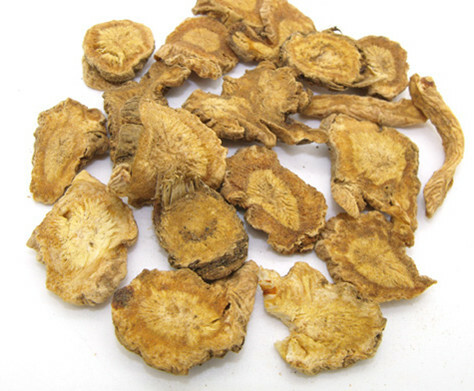 This herb is usually used to dispel wind-damp and stop pain of arthralgia. It is indicated for wind-cold-damp arthralgia, marked by joint pain, sinew spasms, and is often used with herbs that dispel wind-damp and alleviate pain of arthralgia. For instance, it is combined with Qiang Huo, Gui Zhi and Jiang Huang in juan Bi Tang from Yi Xue Xin Wu (Medicine comprehended). It is also indicated for wind-cold-damp pathogen stagnation transforming into heat where the joints are red, swollen, hot and painful. This is called heat arthralgia. This herb can be combined with herbs that clear heat, expel dampness, and dredge the meridians such as Yi Yi Ren, Di Long and Wu Shao She. Aside from this, this herb has the ability to alleviate spasms. It pungently disperses exterior wind and extinguishes interior wind to stop spasms. It is indicated for wind toxin invading the interior and meridians inducing interior wind which leads to tetanus marked by muscle spasms, twitching limbs, stiffness of the nape, neck and back, or arched back rigidity. It is usually used with herbs that dispel wind and alleviate spasms. For instance, it is combined with Tian Ma, Tian Nan Xing and Bai Fu Zi in Yu Zhen San from Wai Ke Zheng Zong (Orthodox Manual of External Medicine). It should be used with caution for blood deficiency and internal wind induced by heat because of its warm property.